Formed by a volcano, this collection of 138 islands makes the perfect getaway for everything from superhero-style activities to cave-inspired massages. If you’ve ever wanted to feel like James Bond, strapping a flyboard to your feet will certainly do the trick. This newfangled contraption looks a lot like a snowboard, but it’s meant for the water. It goes something like this: The flyboard propels you into the air by water pumped through a hose connected to a jet ski. You steady yourself, let out a few wheeees and wahooies and then plop back into the turquoise water. First-time flier? No worries. Coconut Rockets will teach you how to launch yourself 35 feet upwards and master turns like a pro. When hunger strikes, the fish sandwich at Art Mels Spicy Dicy is a must. Many say it’s the best fried fish sandwich on earth. A fit of exaggeration? Perhaps. But that is the kind of enthusiasm this meal provokes. Huge appetites will appreciate the famed dish—fresh snapper flash-fried in soybean oil and served on raisin bread—because it’s stacked about 5 inches high. One sammy will set you back $11.50, but it’s entirely worth it. Even celebrity chef Marcus Samuelsson is a fan. Top it off with cheese and coleslaw and a ginger beer, and you’re good to go. If you’re serious about getting away from it all, heading underground into a subterranean limestone cavern is the answer. At Grotto Bay’s Natura Spa, guests have their lucky limbs lathered among the ancient stalagmites and stalactites of Serenity Cave, a 500,000-year-old relic complete with an crystal clear ocean-fed lake. Book the signature Natura massage, the perfect combo of Eastern and Western techniques. Then, continue in sloth mode by taking a dip in the natural pool. Or, down a rum swizzle at Bayside Grill while you gaze at the Atlantic. 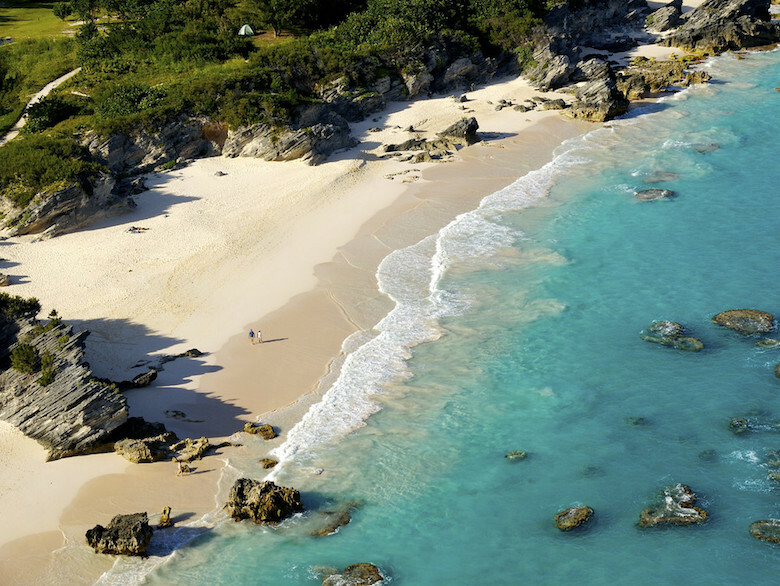 There are about 43 public beaches and coves in Bermuda, so scoring your own stretch of sand is as easy as putting on a pair of Bermuda shorts. Admiralty House Park, with its panoramic views and craggy cliffs, is a prime picnicking spot. 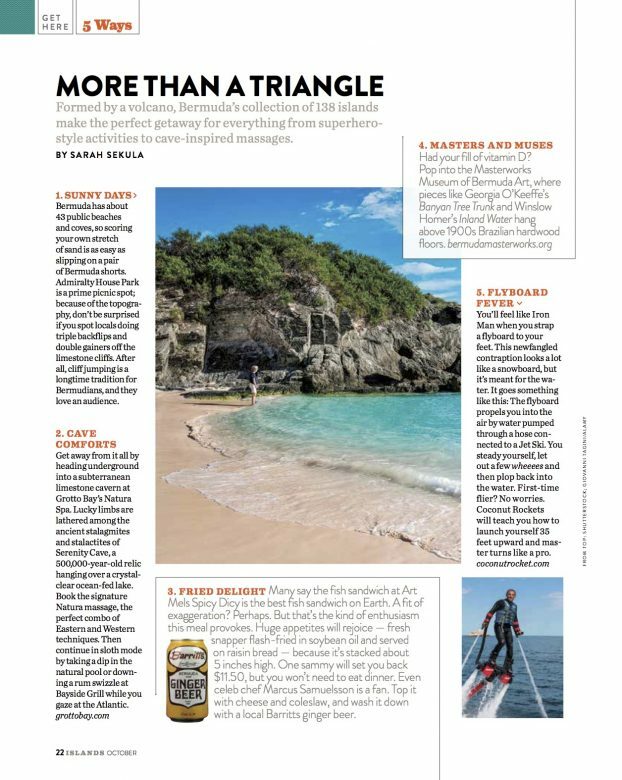 Because of the topography, don’t be surprised if you spot locals throwing triple back flips and double gainers off the sweeping limestone cliffs. 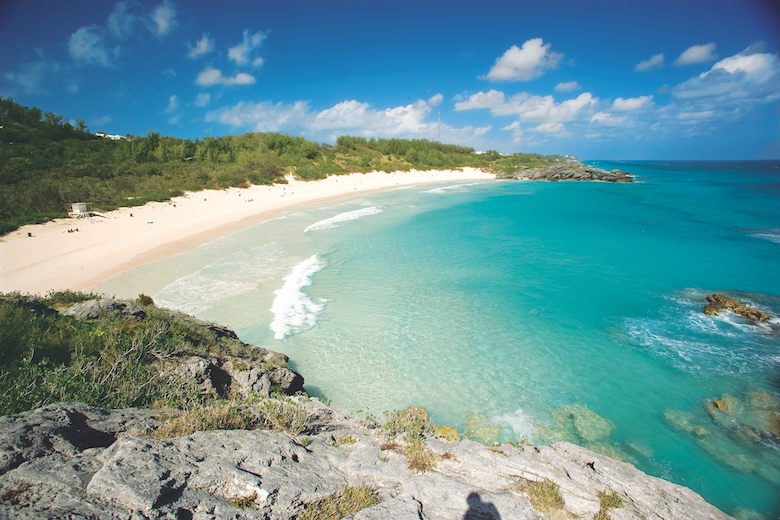 After all, cliff jumping is a longtime tradition for Bermudians. Lucky for you, they love an audience. 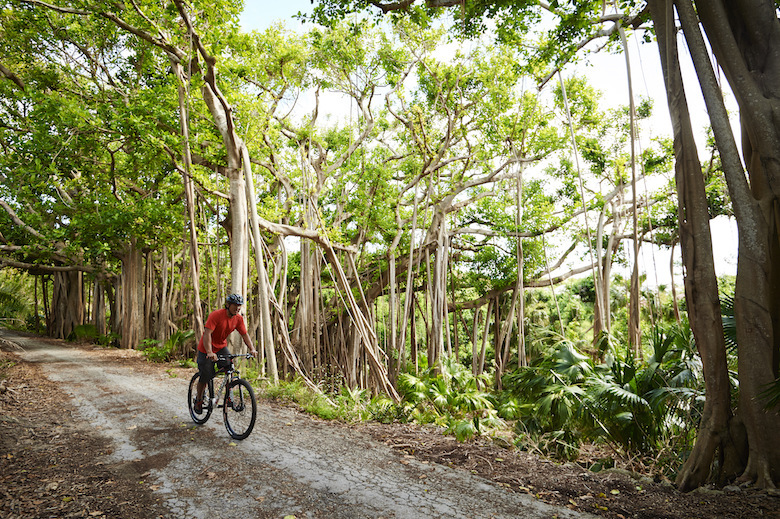 When you’ve had your fill of vitamin D, escape the sun for a bit and pop in to the Masterworks Museum of Bermuda Art, which houses more than 1,300 art pieces like Georgia O’Keeffe’s Banyan Tree Trunk and Winslow Homer’s Inland Water. 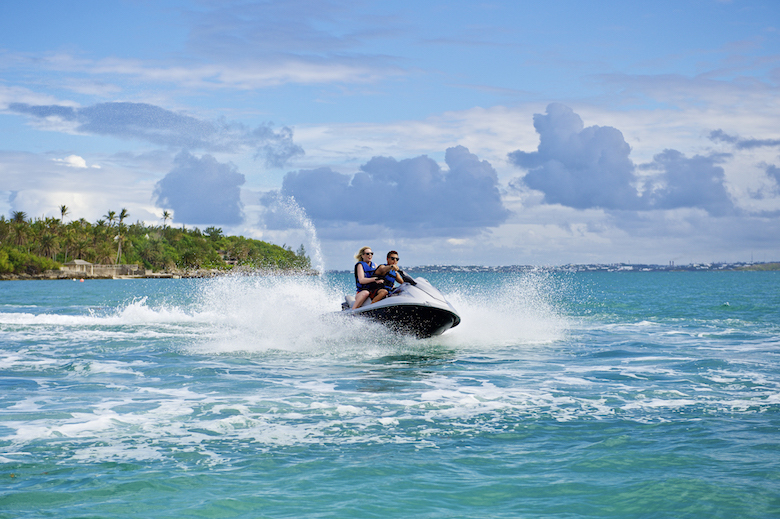 Set among the extensive Bermuda Botanical Gardens, this is the island’s first purpose-built art museum. Beyond the artworks, the building itself is a gem. Once an arrowhead processing plant dating back to the 1900s, its floors are made of Brazilian hardwood and there’s an 18th-century mansion on the property.